After five years of studying to become a dentist, you might think someone had ‘made’ their career. But Hassan Adnan, from Huddersfield, West Yorkshire, is planning to become a maxillofacial (relating to the jaws and face) surgeon – which involves obtaining a medical degree on top of his newly acquired dentistry qualification. 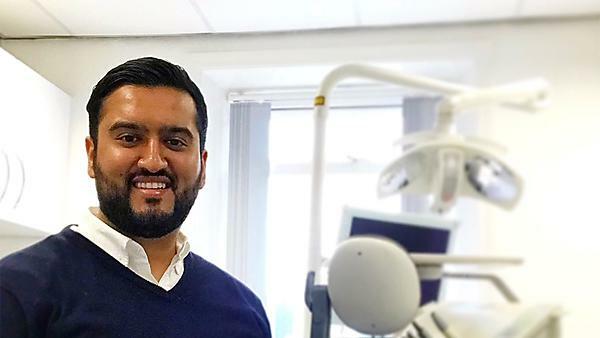 Hassan is part of the first cohort to graduate from the five-year BDS (Hons) Dental Surgery programme at the University of Plymouth Peninsula Dental School. Here, he explains why he chose to become a dentist, and how he plans to achieve his dream. Growing up in Huddersfield, I became fond of the profession at the age of 14 when I was undergoing extensive dental treatment. The way the dentist approached me, and provided holistic and caring treatment truly allowed me to smile again. This motivated me to be in the dental profession, so that I could do the same for someone else. I chose to study in Plymouth as the Peninsula Dental School was the only school which gave early clinical exposure, which means that after only five months of my first term, I was seeing patients on the clinic. This experience was invaluable, and has made me a confident clinician leaving dental school. After graduating, I will be carrying out my dental foundation training at a practice in West Yorkshire, which will involve general dentistry working for the NHS. I will then go on to carrying out a hospital-based training year, possibly two, as a senior house officer, working within a maxillofacial department. The aim is then to carry out postgraduate training, by completing a degree in medicine, with further surgical training to allow me to pursue a career as a maxillofacial surgeon – it’s going to be very full on! During this, I would like to also carry out some academic work, by writing publications on dental research and presenting at conferences in and outside of the UK. I have thoroughly enjoyed the surgical aspect of dentistry, and was always engaged in those lectures involving head and neck trauma/pathology. During university, I was lucky enough to have been able to write my first dental article, and present at a conference in London around the topic of 'public health' in front of the General Dental Council and British Dental Association. I really enjoyed these opportunities and it has given me an insight into a possible academic career! I may even return as a clinical supervisor one day – watch this space! Looking for medicine and dentistry information? The Faculty of Medicine and Dentistry host its own open days. There is limited information at the main University open day for medicine and dentistry courses, so have a look at the school for more details.